Wildlife TRAPS works to strengthen the knowledge base, resolve and cooperation of governments, inter-governmental organizations, the private sector and NGOs for tackling wildlife trafficking between Africa and Asia. Actions to improve governance and dismantle organized criminal operations will secure threatened wildlife and also generate personal safety, food security and economic benefits for the communities connected to these species and their ecosystems. Wildlife TRAPS is a program of the International Union for Conservation of Nature (IUCN), with implementation by TRAFFIC, IUCN’s partnership with World Wildlife Fund. Conducting targeted issue assessment and analysis to set priorities and inform rapid action to address emerging or escalating threats. Analyses to date have focused on trade dynamics for African elephant ivory, African rhino horn, South African abalone, and all eight species of pangolin, as well as ivory markets in Central Africa and national wildlife trafficking assessments for Kenya and Uganda. Convening Collaborative Action Planning (CAP) Workshops where stakeholders promote, discuss and deliberate on strategic actions they can take together and individually, as well as implementation of “quick win” activities where priorities and opportunities are already established. 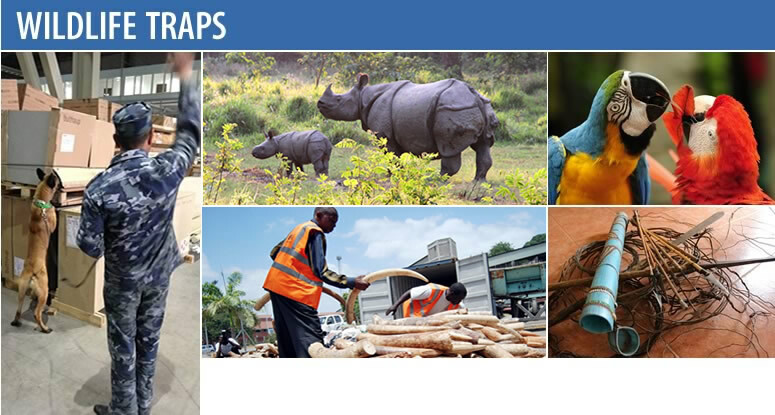 CAPs have focused on engaging the transportation sector, understanding demand reduction, delivering strong CITES national ivory action plans, and improving the application of wildlife forensics science to crime investigation. Supporting stakeholders to implement actions that will effectively tackle illegal wildlife trade along trade chains for species products between Africa and Asia. Conducting adaptive management processes to ensure these actions are effective in disrupting wildlife traffickers’ business and acting as a deterrent for others. For example, Wildlife TRAPS supported an after action review of the May 2015 Operation Cobra III in order to identify implementation challenges and capacity gaps that should be addressed before Cobra IV or other similar actions. Operation Cobra III was the largest transnational wildlife law enforcement campaign ever, involving 62 countries, more than 300 arrests, and tens of thousands of wildlife products confiscated through more than 600 seizures.